This Perma-loc Tape Tee x Slip Adapter is used to join runs of drip tape from a PVC pipe connection. The slip end is a socket/spigot connection made of durable ABS material. Sizes are 5/8” Perma-Loc x 5/8” Perma-Loc x 1/2" Socket / 3/4" Spigot. 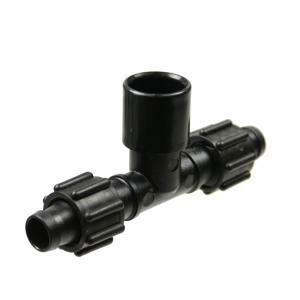 The socket (female) size fits over 1/2" PVC pipe while the spigot (male) size fits inside 3/4" PVC socket fitting. Please Note: Joining ABS to PVC requires the use of special ABS to PVC Transition Solvent Cement.